Comfort food to boost your mood…iViva México! In my experience, Mexican food elicits the most definitive reaction from people. A typical response from my fellow co-workers prior to a tasting I organized at work was, “I love Mexican food” or “I will eat the heck out of some enchiladas, don’t dare me” or “I love guacamole,” all with a toothy grin and a lingering look of euphoria in their eyes. 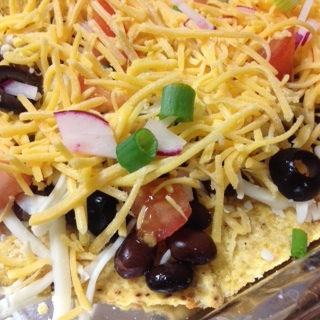 Mexican food is a beautiful thing and has evolved over the years from hamburger hard shell taco night to tamale pie, tinga de pollo (chicken tinga) and sopa de tortilla (tortilla soup). For me, it has always been a comfort food. The nasal euphoria of fresh cut onion, garlic and cilantro fills my kitchen along with the thick aroma of meat stewing in dried chiles. I lose myself in Mexican cooking. At times I believe I am in a trance, then, I end up with a delicious and memorable soup. It’s magic I tell you. 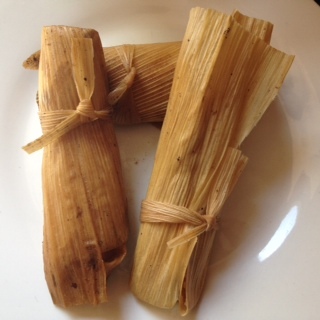 Tamales take a whole day, but I am never too exhausted to eat at least 3 when they finally come leaping out of the steamer onto a plate full of frijoles borrachos (drunken beans) and Elote (Mexican street corn). My next blog will be from a class I taught on Mexican food as well as a tasting I did for my co-workers based solely on ingredients purchased from Trader Joe’s. They do not sell dried chiles! It was a challenging adventure. Today, I am in desperate need of a bowl of homemade tortilla soup. Tortilla soup is my go to when feeling sick, cold, down or just really hungry for Mexican soul food. My brother loves to eat this as though it will never be made again and I need to buy him his own bag of tortilla chips. (see photo below) I love him dearly and I know he will always and forever love Mexican. To you my brother, I love you. iViva México!